Well, who doesn't love a good rags to riches story? Thor was pulled from a terrible situation when his owners were arrested. His eye was slashed and his hair was so bad he had to be completely shaved down. His new owners met him at an adoption event and fell in love. Look at him now!! 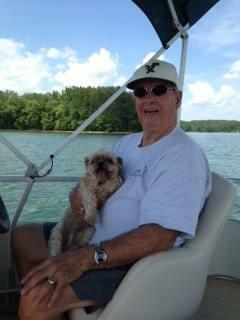 He lives the dream on Lake Lanier. We are so happy for him. Thanks to you new family for not shopping but adopting! !